You know that Rome wasnt built in a day, but just how did a cluster of small hilltop villages expand to become one of the greatest empires in history? Why did Romulus kill his brother Remus? How was a legion organized? Did people really speak Latin? What entertainment could you see at the Colosseum? And what was daily life like for a Roman citizen? This book takes a novel approach to answering all these questions and more. 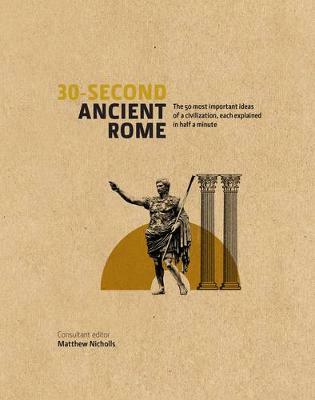 30-Second Ancient Rome presents a unique insight into one of the most brilliantly governed societies, where military might and expansive empire paved the way for technological advances that helped shape our modern existence. From aqueducts to sewers, from mosaics to medical diagnoses, this is the straightest road toward understanding the 50 key innovations and ideas that developed and defined one of the worlds great civilizations.